So I made these earlier this evening. As I wasn't really hungry it was all I needed for dinner. 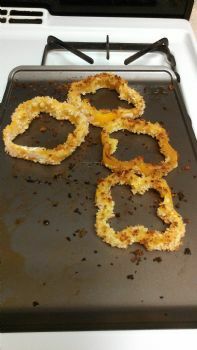 The pepper rings were good! I also used what was left of my spaghetti sauce for dipping sauce because I don't like to waste food. They are coated with: panko crumbs, paprika, garlic powder, salt ( I use Himalayan pink salt), egg and flour. I used 1 pepper and halved the recipe since it was just for me! I will be using other veggies in the near future with the same mixture. Looks Yummy! Thanks for sharing. Are they baked? Fried? I am doing Keto. Do you think I could use parmesan cheese to substitute for bread crumbs? That sounds really good! I also like using Panko, and I am with you that I don't like to waste food either. Good job! Sounds good! Thanks for the recipe!